You can book the apartment with half board (breakfast buffet, dinner with menu choice and salad buffet). Equipment: Our apartments in Meltina / Mölten have a fully equipped kitchen with dishwasher, toaster, kettle, coffee maker and refrigerators and are equipped with shower, toilet, satellite TV and safe. On arrival you can use the apartment from 16.00. On departure we ask the to leave within 10.00. In case of early departure, the entire booked period will be charged. 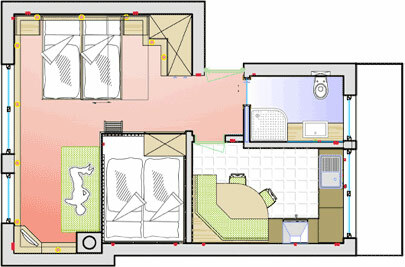 The room shown may be equipped differently, space and furnishings differences are possible.